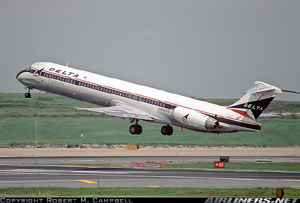 On July 6, 1996, at 1424 central daylight time, a McDonnell Douglas MD-88, N927DA, operated by Delta Air Lines Inc. as Flight 1288, experienced an engine failure during the initial part of its takeoff roll on runway 17 at Pensacola Regional Airport in Pensacola, Florida. Uncontained engine debris from the front compressor, front fan hub of the No. 1 (left) engine penetrated the aft fuselage. Two passengers were killed and two others were seriously injured. The takeoff was rejected, and the airplane was stopped on the runway. The airplane had been destined for Hartsfield Atlanta International Airport in Atlanta, Georgia and included 137 passengers and five crew. The National Transportation Safety Board (NTSB) determined that the probable cause of this accident was the fracture of the left engine's front compressor fan hub, which resulted from the growth to failure of a fatigue crack. A causal analysis undertaken as part of the accident investigation revealed the following: The crack initiated from an area of altered microstructure that was created during a hole drilling process by Volvo for Pratt & Whitney. The anomaly went undetected by Volvo's production inspection system.